Rotary Clubs of District 3291 (India) have 13 Rotary Eye Hospitals. Each hospital is self-sustaining through private full-cost operations covering hospital expenses. Rotary Foundation Grant Projects offer free procedures for low-income patients. The hospitals are owned by the Rotary Welfare Trust The 13 hospitals currently serve half a million out-patients and perform 30,000 Intra Ocular Lens (IOL) implant surgeries annually. 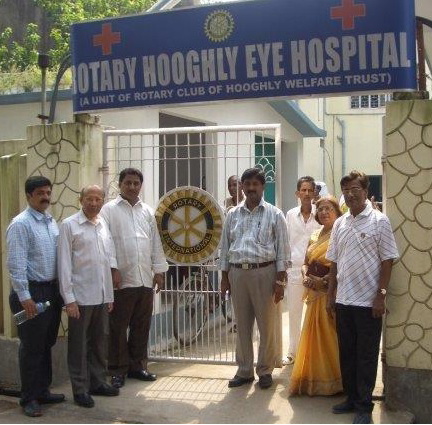 The Rotary Hooghly Eye Hospital was started as a small eye clinic in June, 2000 in a rented building in the small village town of Bansberia in the District of Hooghly, West Bengal, India. Within two years the clinic was converted into a full fledged Eye Hospital. As the need was great, the hospital grew and was serving over 50,000 people annually, both at the hospital and in deep rural areas through Eye Camps. In 2003, the hospital completed 5,000 IOL surgeries both fully paid through Rotary Foundation Grants. With the assistance of Rotary Clubs in the UK, the USA and Singapore the latest modern equipment for cataract surgery was installed and used to treat patients. This year, the need for treating retina and glaucoma was identified. This was discussed with DG Frank Wargo during his visit to India. Thus District 7890 and DRFC Eileen Rau of RC West Hartford joined with several clubs in the UK to fund a Global Grant project of $97,530 and a second grant of $ 77,444 led by PDG Susan Klock of RC East Hartford. The following District 7890 Clubs were involved in this project: East Hartford, New Milford, Salisbury, Torrington-Winsted, Watertown, Glastonbury, Amherst, Easthampton, Franklin County, Northampton and Great Barrington. These Foundation Global Grant Projects will fund the required eye equipment that will serve patients in the rural population of West Bengal, providing affordable retina and glaucoma treatment at the Rotary Hooghly Eye Hospital.